I have a feeling that my day 2 orange nails are going to be a pretty common design theme for today. Traditional monarch butterfly wings - and I'm not sure why I started the challenge with two butterfly designs. I actually did a subtle gradient on my nails using Picture Polish Citrus and Ulta 3 Chocolate Cake, but then I wanted sparkle, so I put a layer of Picture Polish Popsicle over the top. Popsicle is pretty sheer, so the gradient still showed through, but it added an amazing orange shimmer. 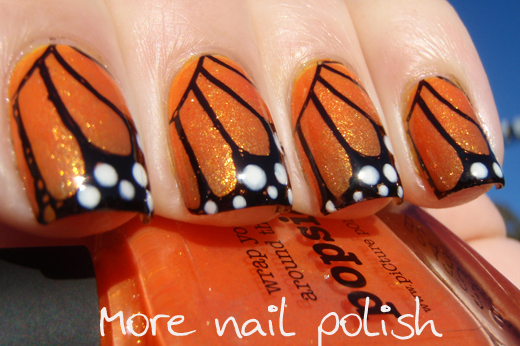 I stamped the butterfly wing design from Vivid Lacquer plate VL004, it's just the perfect size for my fingers. Here is a shot with my daughters pet monarch butterfly. Before anyone flames me for keeping a butterfly in a jar, know that it's electronic. Check my instagram account later tonight for a video of the butterfly and my nails in action. 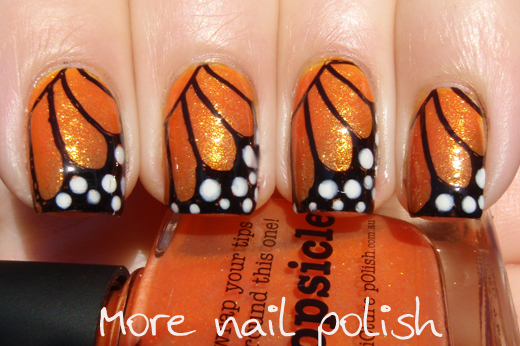 Ooh, I also did monarch butterfly nails for day 2! I won't have mine up until later tonight though. Love these! !The most beautiful butterfly wings I've ever seen! That is aboslutely lovely! I do love butterflies. The last one was absolutely lovely too, btw. 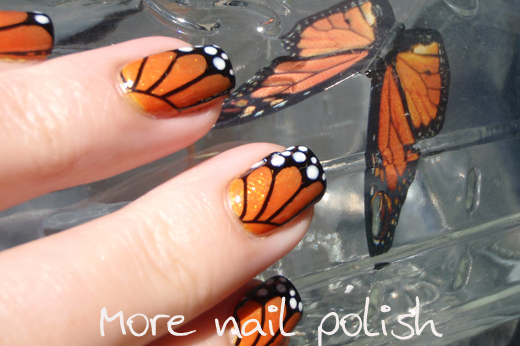 I really wanted to do monarch nails today too but I don't have the stamp. I decided against freehanding them, knowing how much better they could look. Yours looks great! Nice! Love the basecolor for these :). 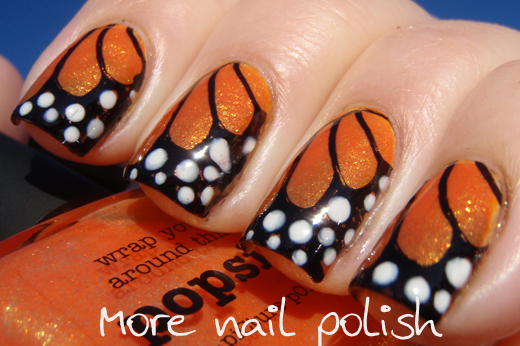 I am dying to try a butterfly mani. Just have to get the stamping plate! This one is lovely.